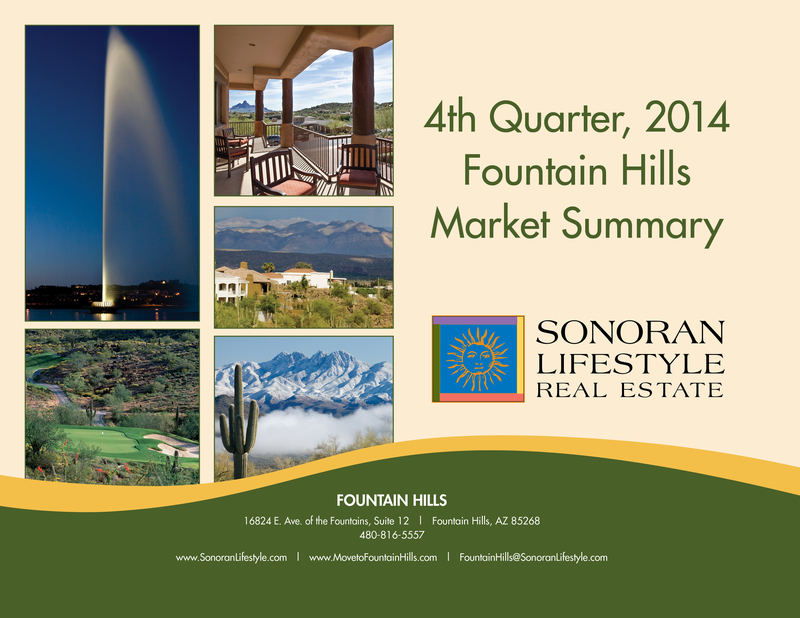 Year-End Fountain Hills Market Report: A Great 4th Quarter! The Fountain Hills Real Estate Market was on fire during the 4th Quarter of 2014, posting the highest 4th quarter sales volume since 2006 with $73 million ($78 million in Q4/2006). 4th Quarter saw a total of 180 residential sales, a sales pace we haven’t seen since 2005 when 209 residential units sold during 4th Quarter. Year over year results are impressive as well, as we finish 2014 with $296 million, a volume we haven’t seen since 2008 with $284 million. Fountain Hills booked 722 sales of homes & condos during 2014, a sales pace not reached since 2006 when 712 units were sold…wow! Average sales price of all Fountain Hills homes & condos sold in 2014 is $410,413 versus 2008 when the average price was $482,205. Custom homesites still have not found traction, but with home prices growing at a substantial rate, it’s only a matter of time before home buyers turn to the economies of homebuilding as an alternative, yet we believe that construction prices and build times are not yet competitive or stable enough to make buyers comfortable. And, there are currently alot of very nice homes on the market, providing a reasonably updated option for most folks to choose. The savvy investors, however, will understand that buyers in future years will want more updated options and energy efficient choices…those who purchase homesites for long-term investment will likely be treated well in the future. Speaking of inventories, total Fountain Hills inventory currently sits at 497 homes (approx. 5% of our total market) versus 426 units one year ago, an increase of only 15%. And, with prices returning to 2008 levels, many folks who’ve been waiting to recover from purchasing in 2006 and 2007 (at the high of the market) are able to consider moving on to other opportunities. All of this is so very encouraging for both Sellers and Buyers. For Buyers, there is plenty of inventory to choose from and prices are still reasonable. For Sellers, especially savvy sellers who understand the value of competitive pricing and aggressive staging and marketing, there appear to be many opportunities to capitalize on a strong market during the coming year. We continue to be encouraged by the number of homes and condos available under $400,000. Currently there are 199 homes and condos in this price strata, or 40% of the inventory. Many of these present excellent investment value and opportunity for appreciation. If you’ve ever wondered whether a rental property investment is a good way to plan for your future, contact us to help you understand more about this great opportunity! This entry was posted in Our Real Estate Market and tagged Fountain Hills Quarterly Market Study. Bookmark the permalink.